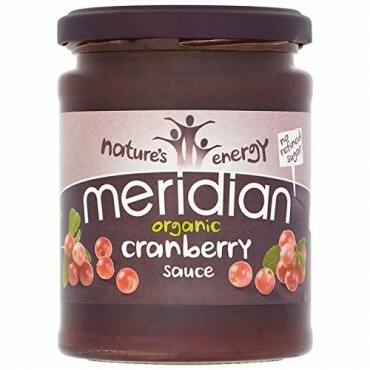 Organic cranberry fruit sauce sweetened with organic apple juice conentrate. Organic cranberries are harvested and graded before being gently cooked in organic apple juice concentrate to produce a flavoursome light set sauce. Ideal accompaniment for organic chicken or turkey. Versatile sweet and savoury cooking ingredient. Follow the instructions provided on the product packaging. All orders placed between Monday-Friday are despatched within 24-72 hours (cut-off time for despatch is 12pm). 24hr guaranteed despatch time for orders placed under our 24hr delivery option. Our delivery service uses Parcelforce which carries a 1-day delivery estimate from despatch. Orders under 2kg in weight will be offered an economy Royal Mail 2nd Class service. This is untracked and carries a delivery estimate of 3-5 working days from despatch. Delivery options differ according to order weight. Free delivery on orders over £30 value, regardless of weight. Our standard delivery service uses Parcelforce Worldwide. This service carries a 2-9 day delivery estimate from despatch. Actual delivery times vary according to your location. Use our delivery price estimation tool in your basket area to check delivery costs for your location.